There are very few rubbish situations in life which can’t be made better by a few slices of pizza. And this, dare I say, includes the abysmal moment when you realise you are stranded at a random airport, miles from home, with your travel plans frustratingly postponed. An American Airlines flight had been scheduled to fly from Los Angeles to Dallas/Fort Worth on Thursday, September 6. However, raging thunderstorms threw a highly annoying spanner in the works. Fortunately for these passengers, Jeff is no ordinary pilot. He is a man who appreciates the sublime moment of opening a just-delivered pizza box; the piping hot cheese, the fresh, floury crust. No doubt about it, Jeff is a pizza man through and through. And when his moment came, he rose to the challenge much like a lump of dough in a pizza oven. Knowing how, given the right ingredients, tensions can indeed be melted like gooey mozzarella, Jeff set about filling his passengers rumbling tums. According to CNN, Jeff ordered 40 Papa John’s pizzas to be delivered at the airport. What’s more, our ham and pineapple hero put in some serious effort to ensure his passengers would receive the best possible customer service. 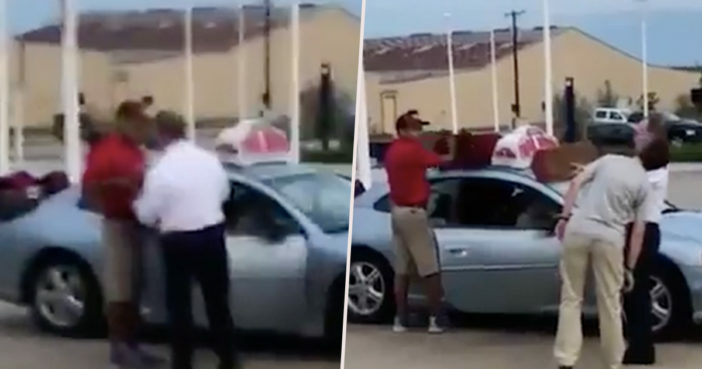 He delivered each pizza personally; rushing back and forth between the delivery driver and the grateful passengers with arms piled high with pizza boxes. We are always proud of our crew members who take great care of our customers who fly on American Airlines and are fortunate that they are the best in the business. My First Officer was on the telephone with crew tracking / hotel desk arranging for our release and hotels for the entire crew. The Flight Attendants manned a galley cart from the aircraft serving waters, juice, and sodas to all the passengers in the terminal. All while the Envoy SPS Personnel were arranging for a bus, re-booking flights, and answering a flurry of questions from these passengers. Thanks to everyone for your help – there is no “I” in TEAM. The passengers were back up in the air the following morning; well-fed and no doubt thoroughly cheered up by this above and beyond service. Now, that’s my kind of Captain’s orders!